A whole new way to arrive for today's traveller. Fly first class on the ground. 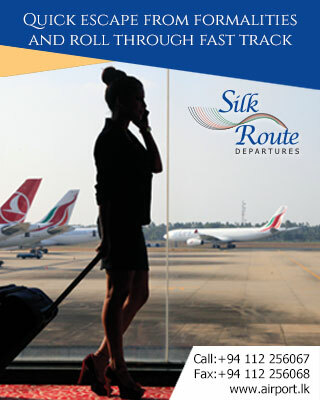 The minute your plane touches down at BIA airport, you will be whisked away to the plush Silk Route Lounge with dedicated concierge services and attendants to process your papers and collect your luggage. Whether you are a business or a leisure passenger travel yourself and enjoy the sanctuary of exclusive lounges in the transit area, Lotus Lounge which is the First Class Lounge for other Airlines, Araliya Lounge, Business Class Lounge for other Airlines and Executive Lounge.